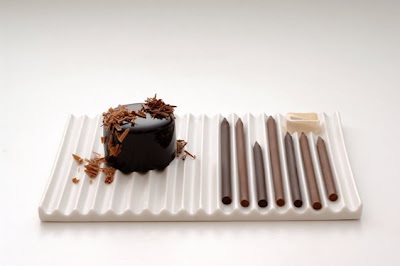 Chocolate-pencils is a collaboration with patissier Tsujiguchi Hironobu, the mastermind behind popular dessert shops like Mont St. Claire and Le Chocolat de H.
Tsujiguchi created a new dessert based on his impression of nendo after conversations with us, and we designed new tableware for them. 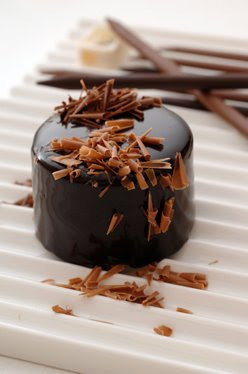 We wanted our plates to show off the beauty of meals and desserts like a painting on a canvas. 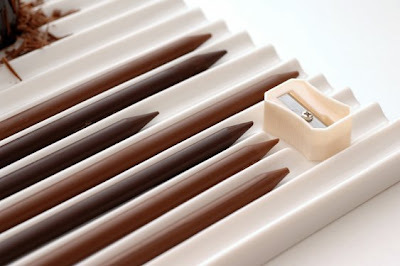 Based on this idea, our "chocolate pencils" come in a number of cocoa blends that vary in intensity, and chocophiles can use the special "pencil sharpener" that comes with our plate to grate chocolate onto their dessert. Pencil filings are usually the unwanted remains of sharpening a pencil, but in this case, they're the star!